Case Law: K.M. v. Tustin Unified School District (9th Cir. 2013) Compliance with the IDEA does not necessarily demonstrate compliance with Title II of the ADA. Districts must ensure that communication with hearing impaired students is as effective as with non-disabled students. Districts must provide auxiliary aids and services necessary to afford equal access. The debate about personal FM versus sound field FM has waged since the late 1980s when sound field amplification systems began to appear in increasing numbers of classrooms throughout the US. 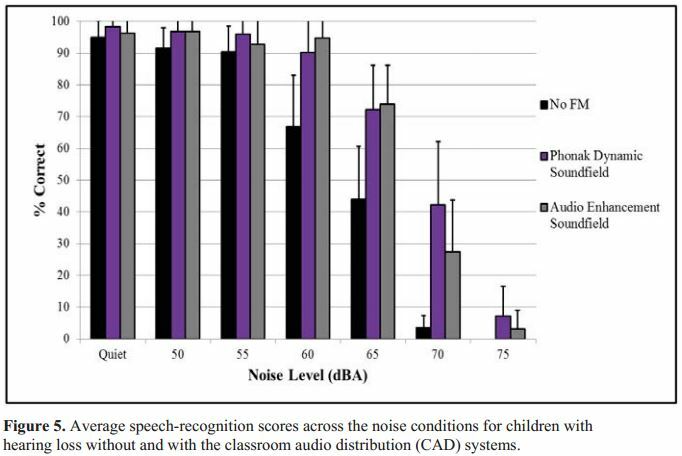 Sound field amplification, or Classroom Audio Distribution Systems (CADS), provide improved audibility of the teacher’s voice for ALL children, not just the child with hearing loss, at 1/4 to 1/2 the cost of a personal FM system. 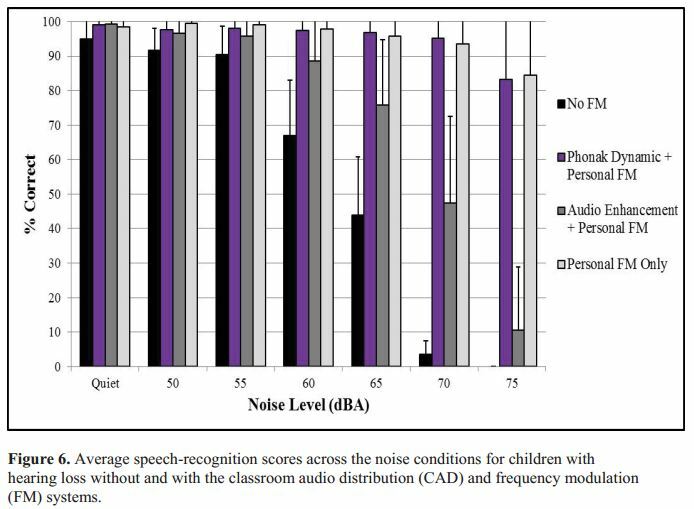 The child with hearing loss is not singled out as the only one to benefit from amplification of the teacher’s voice. From a school budget standpoint it is not a surprise that purchase of CADS is often preferred over a personal sound field system. But the real question is whether it will provide the same benefit in allowing the student to access verbal instruction equal to class peers. experiments that indicate desktop FM or personal FM use results in better speech perception than using sound field amplification or hearing aids or cochlear implants alone. From Australian Hearing: Personal FM or Soundfield Amplification? A short summary of research. 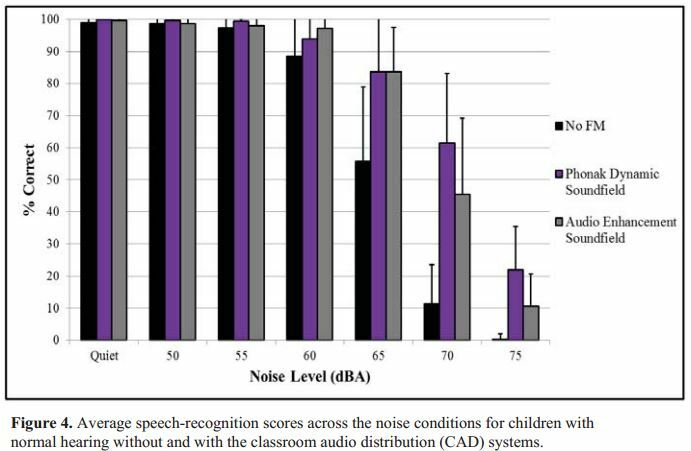 ARTICLE: Improvements in Speech Recognition Using Cochlear Implants and Three Types of FM Systems: A Meta-Analysis. J. Educ. Audiol, 15; 4-14 (2009). 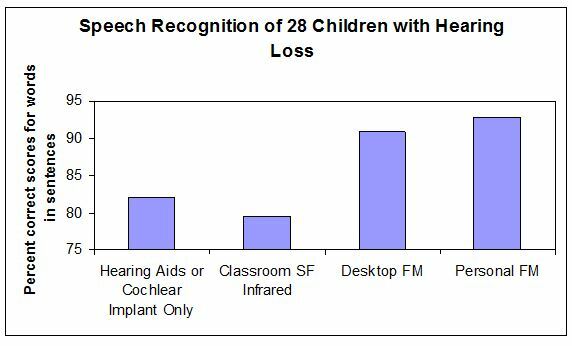 For students with cochlear implants: with sound field had 3.5% improvement, for desktop FM had 17.1% improvement, for Personal FM had 38% improvement. GUIDE BOOK: How to Combine Personal FM and Classroom Sound Systems (2013). Child participants in study: 15 children with normal hearing (mean age: 8 years; range: 5-12 years of age), and 13 children with hearing loss (mean age: 9.5 years; range: 6-13 years of age). infrared CAD system with multiple loudspeakers. obtained from use of CAD systems. some of the benefit provided by the personal FM system. and personal FM systems are used simultaneously. systems manufactured by two different companies. performance with a personal FM alone.